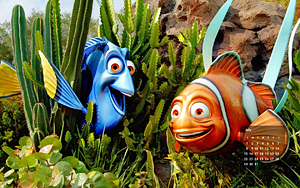 Dory and Marlin are here to spend July with you! This was taken at Epcot near The Seas with Nemo and Friends. You will need to have Adobe Reader on your computer to download the calendar(s). Just click on the photo to download the calendar you want. When printing CD Jewel Case size, make sure “Page Scaling” in your print dialogue box is set to “None” to ensure that the calendar prints out at the correct size. This one prints out at 8.5″ x 11″. It’s handy if you need a calendar that you can write on. Watch for updates on my facebook page. I’ll post a link when each month’s new calendar is posted.